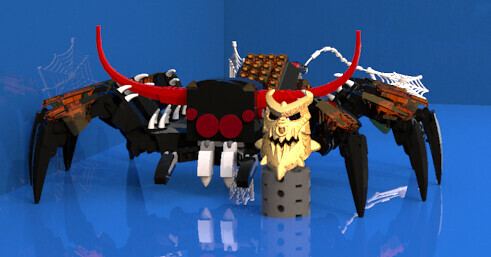 Ahh, the magnificent Lord of Skull Spiders. Many thought he was a rather weak set, sacrificing playability and some aesthetic appeal for fairly boring function. Recently, I've been playing around with system-based action figures, and, after seeing all these skull army creations pop up again, I decided to make my own version of him. I decided to make him more spiderlike, with the face of a jumping spider, the horns of a jewelled spider and of course, all eight legs, two spinnerets and two pedipalps. I made the pedipalps the smaller, female morph because I figured that, if they're too small to even be depicted in the actual set, they shouldn't actually be bulky in my MOC. 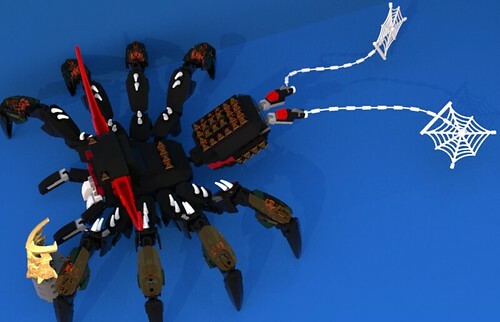 Features string-shooting stud blaster spinnerets, 41 points of articulation and a stand which is supposed to hold the golden mask of skull spiders, although LDD lacks it. As far as I can tell, he's fully buildable. A better look at the stud shooter spinnerets and back. Ventral view of the big spider and his shiny. It's face is kinda cute. Yeah, it's rather difficult to try and make a realistic spider face and not make it look huggable to some extent. Any suggestions? I don't know, maybe try more angular pieces to give it an angrier look?